Edit: for some reason my scheduled postings are not posting...not sure why??? 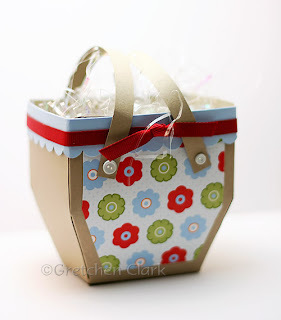 Here is a quick post...I purchased Lauren's Pack a Picnic Template and could not wait to give it a try!!! It went together pretty quickly. This is the smaller one, which is the perfect size for a gift card and some candy. I cannot wait to make some more!!! They are really fun! This is going to be a light week for me in the office (so excited!). 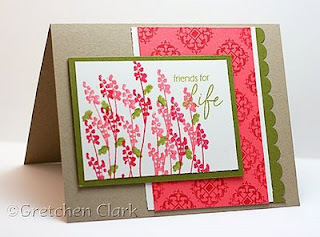 I am going to get to work a few half days...so I am planning on getting some major stamping time in! I was thrilled to get my complimentary copy of PC Card Creations in the mail a few days ago...check out the cover, It is my card:D (I had 3 others published in there too!!) so exciting!! Woot! I was so happy that I was released from Jury Duty yesterday!!! 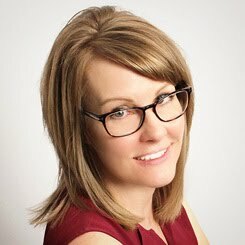 I called on Monday evening to find out my reporting instructions and my group was told to call on Tuesday morning at 11am...I called and my group was released~woot! Sharon went to Italy last month with her parents (Lucky! 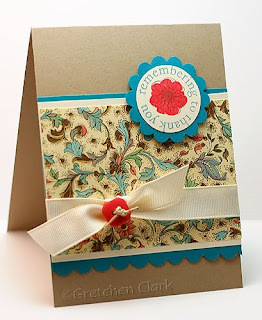 ), and she brought me back some really pretty papers...I almost couldn't cut into them~because I have a serious hoarding problem...but I did, and made this card to thank her for thinking of me...she is a sweetie! I made a few of Mike's favorites that I don't make very often (since I am "trying" to do WW). We had coney island hot dogs, french fries and root beer floats, with a WW berry tart for dessert (it was only 3 points..but after eating about 15 points for lunch, it didn't really matter, LOL!). Oh yeah, I made Mike that T-shirt in Photoshop, and since my printer is being fixed, I had Ashley print it for me on Avery Transfer Paper...Ashley informed me later that I didn't need the T...ha ha!!! 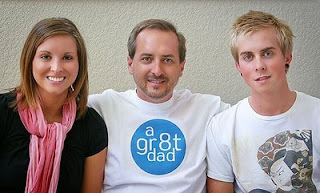 Oh well, I want to emphasise that Mike is a GREATT Dad!!! I was summoned for jury duty on Tuesday (arghhhh! ), I am really hoping when I call tonight to check in, I get the message that I don't have to report...now don't get me wrong, I am all about doing my civic duty, but I have been picked 3 times! This Sunday is Father's Day...I whipped up this little gift for my step dad...Moe (aka "the grouch"). He likes to fish, so since this is the only fish image I have...decided to ink it up:D I colored in the little fishes with my SU! markers and popped one up on each image with 2 pop dots (for that dramatic dimentional effect, LOL!). I filled up the goodie bag with some treats from Trader Joe's (love that place), and put a gift card for him inside the card to one of his favorite places to shop. I was editing photos last night and found this card that I forgot to post. So decided to post it for ya today. I used my very favorite set by Papertrey, Floral Frenzy. Did you get to check out the new releases on the 15th? Wish I had tons of $$ to spend, but I am going to have to narrow my wish list down from the past few releases, LOL! Sorry for the late post today...I totally forgot to get my post ready last night, Oops! Better late then never, right? 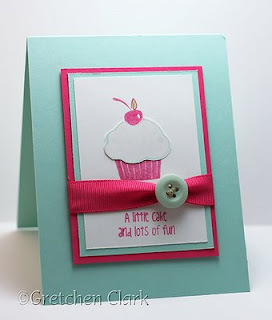 Here is a cupcake card I made last week (I noticed that the main image was crooked after I shot the photo...argh!! didn't want to re-shoot the picture, but it has since been fixed and mailed). I am liking this color combo~Aqua Mist with Berry Sorbet! I did however, snag this today and cannot wait to give it a try!!!! Such a cute template!!! I am so happy it is Friday...TGIF!!! I have been working extra hours this week covering for Ashley while she is in Lynchburg, VA taking a class for her Master's Degree. I usually have Friday's off (I am so spoiled!! ), so I actually worked a 40 hour week, LOL! Ashley comes home tonight, and I am so glad! Boy did I miss her!!! You would think that working together, going to church together, and hanging out during the week that we would get sick of each other...NOPE!!! 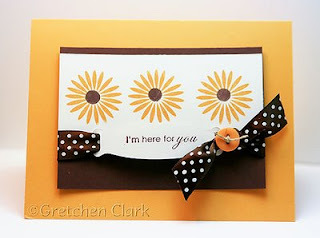 Here is a card I made using a color combo I saw on Dawn's blog. I LOVE it! 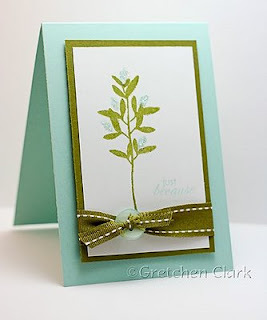 And can you believe that there is no ribbon on the card??? I know, shocking!!! That seems to be the theme these days, LOL! I was hoping that my schedule would slow down after my photography course came to an end, but it doesn't seem to be slowing too much! I have been wanting to get back to my power walking (I used to go every day), but it has been so hard to get back into the swing of things, I hate to admit it, but it has gone downhill since Ashley's wedding in October (8 months ago!!). Why is exercising so hard to work into my schedule now??? It seems like that is always the fist thing to get eliminated from my day when I get busy...argh!!! Maybe trying on my bathing suit will get me motivated, LOL! Here we are back at Monday again...I am gearing up for another busy week, so today is gonna be a quickie post. 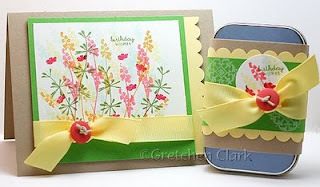 Here is a birthday card I made last week (I like to have lots of birthday and thank you cards on hand). 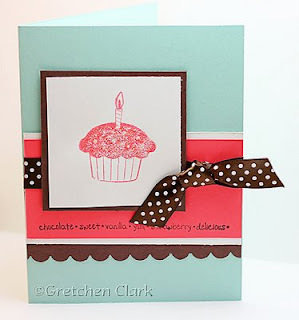 I used my Cupcakes stamp from The Paper Company. I paper pieced again since I didn't want to color the frosting part (I should try those Copic Markers...but I am afraid I will want them ALL! and they are kinda pricey...if $ were no object...how fun would that be?!). Mike and I have been celebrating graduations for the past few weeks. We have had several kids from our church graduate from several different high schools this year. Monday we celebrated our friend Richard's graduation. 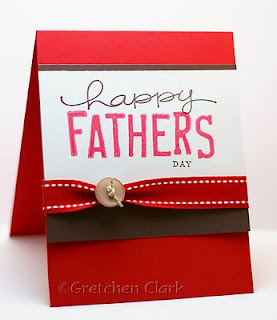 I whipped up a quick card for him (you know how I struggle with boy cards!). I checked with Mike to make sure it wasn't too girly...he said it was okay, LOL! 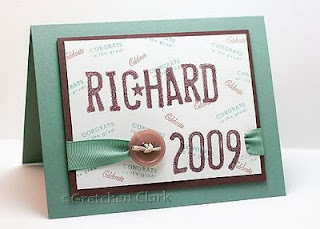 I used the stamp set I purchased at Michael's called License Plate by stampology. I like the alphabet/numbers that are in the set (great for personalized cards). All I had to do was slip in a gift card and some cash...and Viola'! I am really looking forward to this weekend...it has been a busy week!!! We celebrated another birthday in our office this week (we have one almost every month). 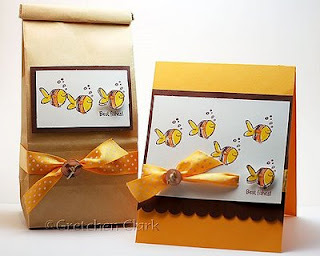 I happily volunteered to make the card and gift card holder (any reason to stamp, right?). 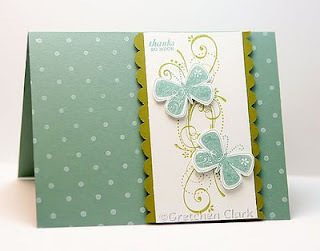 I was on a roll with my PTI Life stamp set, and was just playing around on a scrap piece of paper with different ink colors...and ended up really liking the outcome...So I trimmed the scrap paper so I could use my creation on this card (luckily no one will look at the back of the cardstock, LOL!). I am going into work a little late this morning so I can hopefully getting caught up on my photography class assignments (this is the last week to turn them in...nothing like waiting until the last minute, right?). I hope I can talk Mike into letting me take his picture (about 50 times) or else it will be a photo shoot with the cats. Boy, another weekend seemed to fly right by and get away from me...I usually have such big plans (and to-do lists) for my days off, and I usually end up procrastinating enough to not get them done *argh* I did get some time in the stamp room...so the weekend wasn't a total loss! 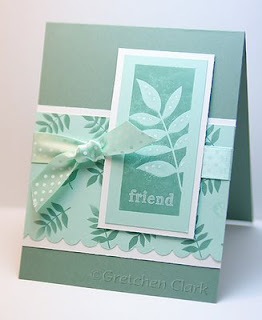 I am in need of some retail therapy (of the stamping kind!!!). I am getting tired of my stamps and need (no want) some new ones (I will try to wait until Papertrey's June release on the 15th). In the mean time...trying to get creative with my much loved stamps. 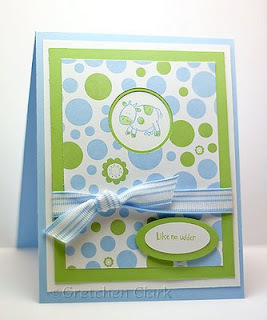 I used Text Boxed for this card, and was pretty happy with the color combo of Ocean Tide and Aqua Mist (PTI~if you can't tell...I Love PTI!!!). I am on the last week of my Photography Class and cannot believe 9 weeks flew by so fast (unfortunately I am behind on my assignments...due to not having willing subject to photograph), I am hoping to get caught up this week and bribe my family to let me take their pictures!!! I know I have said it before, but if you are wanting to learn how to take better photos, and learn how to get your camera off auto mode...this is an awesome class!!!!! Well worth the $. Karen Russell is an awesome teacher and explains things so that regular people can understand.